The Woman’s Literary Club of Baltimore was modest in size but focused in its goal to support women writers in Baltimore for more than 50 years. The Club grew out of the tradition of women’s clubs that flourished in late nineteenth-century America. A number of literary societies founded throughout the country during this time provided women a chance to read and discuss literature in a supportive setting. These clubs originated to fill a void left by the limited educational opportunities for girls. The members of the WLCB didn’t just read and study literature, however. They published it. The group that founded the Baltimore club provided mutual support for one another, not just in their study of literature but to support each other’s efforts in pursuing literary careers. One of the first orders of business at the initial meeting was the selection of a name. The inclusion of Woman in the club’s title was significant. Not only did it identify the membership; it also announced the belief that women writers were different from their male counterparts. 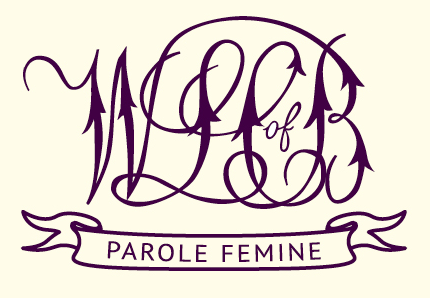 Club members took as their motto “Parole Femine” (womanly words), a phrase from the Maryland state motto. They believed that women writers brought a different sensibility to their work and could raise the standards of literature. The Club founders were serious in purpose and set out a formal structure through which to achieve their goals. Their Constitution enumerated the duties and responsibilities of officers and members. The Club was run by elected officers, who formed the Club’s Board of Managers. The President assumed leadership in most facets of the Club’s life, setting the tone and parameters of work. The first two presidents, Francese Litchfield Turnbull (1890-1898) and Letitia Yonge Wrenshall (1899-1915) forcefully led the Club, each molding it to her view of literature and literary discourse. Membership in the Club was limited at first to women “who had a sufficient interest in literature to have devoted some time and thought to original work for either newspapers or magazines or of a more lasting nature”; all eleven of the Club’s founding members were published authors. The requirement that members be published authors eventually eased, and women interested in literary pursuits were offered membership. At its 30th anniversary, it was noted that the Club had been eager to recognize and foster young talent. Publication, however, remained an important goal for the Club, and the president’s remarks often praised the publication successes of its members. The Club met weekly on Tuesday afternoons between October and May, leaving the summer months free for members to escape the city heat in travel or stays at summer homes. The Club never owned a clubhouse, as was common for clubs at this time. They remained a fairly small group, capping their membership at 100, and while this allowed them funds for their activities, it would not support the purchase and maintenance of a building. Instead, the group affiliated with the Maryland Academy of Sciences in 1891 as associate members, and were allowed to establish their meeting room in the Academy’s building. The Academy moved several times in the Club’s early years, but when they finally moved to 105 West Franklin Street, the former mansion of Maryland governor Thomas Swann, the Club was provided with a comfortable meeting space until 1921, when they began meeting in a room at the Arundell Club at 1000 N. Charles Street. The heart of the Woman’s Literary Club of Baltimore was its committees, where the members tested their literary works to be presented at the weekly meetings. Each member was required to belong to at least one committee, but it was recommended they not belong to more than two so as to have time to give adequate attention to the committee work. The committee chair selected the topics and organized the discussions, debates and critical analysis of members’ work. The committee setting was where the members presented their work and received, as one member put it, “a baptism of friendly criticism.” In committee sessions some members shared poems, short stories, book chapters, translations, or an act from a play. Others wrote papers on artistic movements, music and musicians, or historical events. After thorough vetting by the committee, papers deemed ready for wider hearing were selected by the committee chair and presented at a weekly meeting of the Club. The committees, and their plans of work, varied from year to year depending on the chair. The committees that presented programs to the Club most often were those dealing with literature: Fiction, Modern Poetry, Drama, Essays, Current Criticism and Translation. Three long-standing committees were Art, Music, and Education. American history was of great interest to the members, supporting committees in Colonial and Revolutionary History, Letters and Autographs, and “Unfamiliar Records.” Archaeology, the specialty of longtime Club president Letitia Yonge Wrenshall, was a long-standing committee. The Club sustained a Committee on Current Events for many years, but the Club generally refrained from discussing volatile political topics. The Club did not admit black members, though at least one Jewish woman belonged (Henrietta Szold, who later founded the Zionist women's organization Hadassah); and while some of its members strongly supported suffrage, no mention of the Club's participation in suffrage activities is recorded. In fact, it was a philosophical disagreement over discussions of social and political topics that led to a split in the early days of the Club. The 1893 constitution of the Woman’s Literary Club of Baltimore stated that its object was for “discussion of the questions of the day--literary, artistic, social and political.” While many of the Club’s early programs were on poets and poetry, several addressed social issues. Tucked in between programs on the Brownings and the Lake Poets in 1890 was a program on “Questions of the Day.” The next season of meetings featured a class on Political Economy, with papers on agrarian law, Russian collectives, and trade unions for women (some of these papers were presented by Szold). The members engaged by these programs on social and political issues suggested that the Club expand its scope to include a wider discussion of social issues. In true Club fashion, the question was studied, debated and voted upon. The result was defeat for those wishing to expand the purview of the Club, and many members resigned from the WLCB to form the Arundell Club in 1894. A history of the Arundell Club traces its beginnings to the resistance to discussion of social issues by the WLCB: “Philanthropy . . . was not smiled upon and there were suggestions detrimental to the feelings of some of us that history was not literature, whilst sociology naturally was anathema.” The Arundell Club represented the new type of club forming in the 1890s, the department club, offering a wide range of topics and activities. While the WLCB remained true to its origins of fostering writers, the Arundell Club offered its 300 members public meetings, sectional study groups, committees for public work, field days, social entertainments and musicales. The WLCB sponsored several types of activities to support their literary purpose. In addition to weekly meetings, they held salons, social events with a musical program and refreshments. Members were permitted to invite guests, male or female, to attend. The Home Committee was in charge of decorating the rooms and providing the refreshments. To provide inspiration for members, the Club maintained a library of books written by themselves as well as their fellow Maryland authors. Each January beginning in 1902, the Club held an annual Twelfth Night Celebration, an elaborate dinner with a musical program and a Christmas cake baked with souvenirs that was paraded through the gathering. On All Souls' Day, November 2, the Club members decorated the graves of authors and artists buried in Maryland. Among those honored were Edgar Allan Poe, Junius Brutus Booth, John Pendleton Kennedy, Sidney Lanier, Col. Richard Malcolm Johnston, William H. Rinehart, and founding Club member Mary Spear Tiernan. In 1907, members of the WLCB organized the Edgar Allan Poe Memorial Association in advance of the centennial of his birth in 1909. The Woman’s Literary Club of Baltimore completed its final season in May 1941. Louisa C.O. Haughton, one of the originators of the Club, served as President for much of its final 23 years. Little is known about Haughton’s tenure, as the records of the Club, housed at the Maryland Historical Society, end with the 1920 season. Notices of meetings and events published in the Baltimore Sun indicate that the Club stayed true to its mission of supporting women writers and their literary pursuits. The Club’s final meeting celebrated National Poetry Week with a contest for the best poem written by a Club member. WLCB minutes, March 19, 1890. The state motto is “Fatti Maschii, Parole Femine,” translated as Manly Deeds, Womanly Words (Francese Turnbull, “Address,” October 2, 1894). WLCB minutes, March 19, 1890. The founders were Christine Ladd-Franklin (mathematics, psychology), Elizabeth Graham (poetry, founder of Lend-A-Hand Club); Louisa C.O. Haughton (stories); Lida Acheson Goddard; Alice Emma Sauerwein Lord (novels, plays); Lizette Woodward Reese (poetry, stories); Hester Dorsey Richardson (history); Mary Spear Tiernan (novels, stories, history); Francese L. Turnbull (historical novels); Mrs. George Whitelock; Katherine Pearson Woods (stories, novels, history). Emily Lantz, “Woman’s Literary Club Thirty Years Old This Week,” Baltimore Sun April 4, 1920. Emily Lantz, “Twenty-Five Years Old Today.” Baltimore Sun March 23, 1915. Francese Turnbull, Emma Lord, Lizette Reese, and Mrs. Whitelock presented the poetry papers. Hester Dorsey Richardson presented the session on Questions of the Day. Mary Wilcox Brown organized the Political Economy session. She was a prominent social worker. Annals of Arundell Club of Baltimore, 1894-1925. Baltimore: Norman Remington, 1926. This tradition of decorating the graves of Maryland writers may have inspired the “Poe Toaster,” an unknown person (or persons) who decorated the grave of Edgar Allan Poe in Baltimore’s Westminster churchyard on the night of his birth, January 19, with a single rose and some whisky—a tradition begun in the 1940s and continuing until 2009.